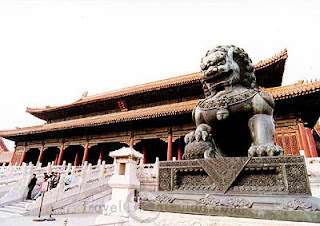 BEIJING -- About a century ago, China's last emperor Puyi removed wooden door sills in his palace for a smooth bicycle ride. His action, though booed as offensive to the ancestors, has become a boon for the mobility challenged visitors. The Palace Museum, known throughout the world as The Forbidden City, is a feudal royal residence at the heart of Beijing, has been reconditioned to improve accessibility in anticipation of thousands of disabled athletes during the Paralympics, running from Sept. 6-17. About two million yuan has been spent since 2003 to place slopes, rubber belts and elevators in the palaces, said Yan Hongbin, the museum publicity director. "What Puyi did saved us some trouble, but it is impossible to simply remove part of the ancient architecture like he did. We need to smooth the way without damaging the view or structures," he added. Designed to manifest the grandeur of the imperial residence, the palaces were probably among the most difficult destinations for those who have to use wheelchairs. Grandiose buildings were only accessible through steep white-marbled stairs up to eight meters high. The palace had few facilities for the convenience of the disabled, said Yan, and those who came were carried up the stairs. With the newly-built facilities, the essence of the museum, including the "emperor's office" -- the Taihe, Zhonghe and Baohe palaces -- are accessible by those who move with wheelchairs. On Thursday, Wang Xiaomei, a retired woman, was lifted on her wheelchair to an eight-meter-tall terrace of the Baohe palace, and it was the first time she had reached that high. "I came here 20 years ago, and only wheeled around down on the ground. It was impossible to get near to the palaces," she said. But it was not easy to get the facilities in place. Yan said architectural protection experts met in more than ten sessions this year to discuss how the facilities could be accommodated. Before a 50-meter-long wheelchair lifter was added to the Wumen Gate, parts of the floor tiles were replaced with cement blocks, as protection rules allow no nails or screws to be driven into the tiles. In order to protect the protruding glazed tiles west of the Baohe palace, engineers installed two sets of elevators, rather than one. Wooden planks were erected to shield the elevators. "We were very careful not to make the lift an eyesore for the visitors," Yan said. Citywide, Beijing has made efforts to improve mobility and accessibility to transport for the handicapped. Xin Ren, a wheelchair-bound teacher, regularly inspects facilities for the disabled in the Dongcheng district of Beijing. He goes around, takes photos and reports inconveniences to the government. "It's still difficult to go to places like the metro, but there have been marked improvements," he said. New supermarkets now have slopes rather than stairs, and many elevators and toilets in public buildings have been renovated for their convenience, he added.